It's been so long since I've written a blog post, I hardly know where to begin. This spring I set my agenda aside as I made arrangements and preparations for a summer mission trip to Kenya. The week after I returned was spent at a cottage with a group of ladies as I attempted to rediscover what time zone I was in. Mid-week my son-in-law went into the hospital a few hours away from home and soon thereafter I found myself with two toddlers in residence for what turned out to be 6 weeks. Throw in a scaredy cat who hasn't left my basement since she came to live with us on LABOR DAY and perhaps you can see why, besides being behind in everything, I'm having a hard time getting back into the swing of things! It's easy for me to get overwhelmed by all that needs to be done and frustrated by all the things I didn't accomplish this past year, but when I start feeling that way I need to stop focusing my feelings and instead turn to God's truth. It's important for me to remember that, while I feel as though I have spent most of the past year on a detour, the truth is that I have been exactly where God wanted me, on the path He chose for me. I need to let go of my self-imposed deadlines and agendas and recognize that my value is not in what I do, but to Whom I belong. 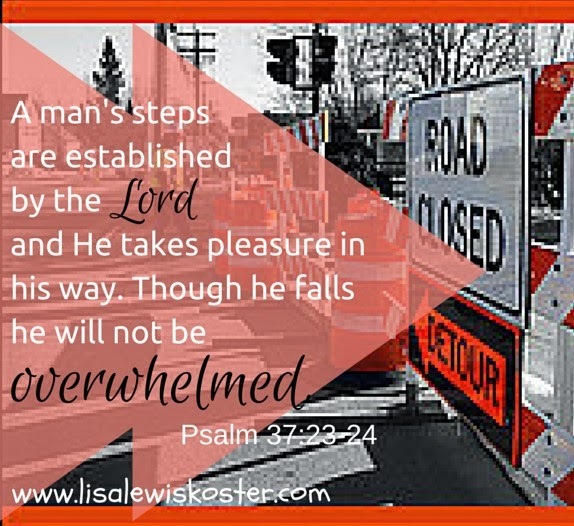 Psalm 37:23 says, "A man's steps are established by the Lord and He takes pleasure in his way. If God is taking pleasure in what I'm doing, shouldn't that be enough? Shouldn't I be doing the same? I wish I could tell you, step-by-step, how to move from satisfaction in completing your own agenda to satisfaction in following God's agenda, but to be honest I'm not there yet. The good news is I know the first step, and that is to be rooted in God's Word. Perhaps I'm looking at this all wrong. Again, I'm falling back into thinking, "What am I going to do to remedy this?" when over and over Scripture is saying that God is the One with the plan. I just need to stick close to Him and cooperate. It is so easy for me to get frustrated when I feel behind or when my plans get derailed. My heart seizes up in anxiety and my vision is so restricted. Much much of this is because of the feelings, the emotions, I allow to take charge. Instead, if I can think of the detour as the plan, planned by God, perhaps I can get my feelings to get in line with God's desires. Thank you so much for your honesty and vulnerability. The love and light of Jesus shines through you, Lisa, and I just want to take this opportunity to tell you that. Following you on Facebook and seeing all you do and are involved with overwhelms me! You are a very gracious woman and fine example. Hard to see it in ourselves, I know! Love your humor. Oh, boy, I'm getting a message loud and clear today. My value doesn't lie in what I do - why do we always seem to revert to that type of thinking? I'm on a health-imposed detour right now and struggling to remain patient with the slow progress. However, it's given me time to be still and hear His voice more. For that, I am thankful! Thanks for sharing over at #TellHisStory. What a treat! I had just wondered about you several days ago, b/c I hadn't seen you for so long and had wondered where were and what was going on. I just saw this and smiled. You are a Kenya-blessing person. Since I've loved Uganda, and only hung in Kenya very shortly re: plane issues. And was near the border a few times while traveling around Uganda. But you grabbed my heart tonight. Thank you for sharing. In life stuff does happen and our plans get changed. You did have some quality time with the young ones, and I pray your son-in-law is better. You also baby sat some cats which is fun too. Thank you for sharing your awesome post with us here at “Tell Me a Story." I'm not there yet either, but I do know that MY to-do list isn't always reflective of what God must want me to do since I always run out of time. :) His timing and ways are perfect. I'm thankful for his grace to help me one step at a time to get there. Thanks for sharing this. Wonderful post. So encouraging to read how God has had you right where He has wanted you to be. That takes all the pressure off, doesn't it?! Even when we question or when it doesn't make sense. So glad I followed you at Woman2Woman! My plans were totally derailed when I lost my career and my physical profile became terminal. But I still do the thing that's immediately before me, no matter how much it hurts. Maybe I'll make it, maybe I won't. Maybe it's worth it, maybe not. But the value and the duty are in the doing. the results are best left to the disposition of the Almighty. Sticking close to Him and cooperating with His plan...always my desire--not always my reality. Praying I embrace His leading and stay true to His path. I love this journey with Him and I long to have an undivided heart, devoted only to Him. Thanks for reminding us that even though life might not be going as we expected or hoped, God has ordered our steps and He is at work in it and through it. Blessings to you! I can see how it goes with my one word for 2015. I chose the word faith. I'm training myself, through prayer, to have faith God knows what He is doing. Only thing for me to do is have faith. I'm visiting from Spiritual Sundays. This post blessed me because you shared the real that life hands us and still learned to look to God for leadership and understanding. God does teach us and love us through His word and He always knows the path of our life. Blessed you joined The Weekend Brew. Welcome back to blogging! I sure do appreciate the reminder that when I am feeling overwhelmed, I am following my own agenda. I am constantly reminding myself to trust in God's divine plan for my life. This is not an easy thing to do, but I always feel some relief when I say it back to myself. I'm so glad I stumbled upon your page over at Faith Filled Friday! As a woman who has endured much change in the last few years, I know what it's like to have to lay down my own agenda, desires and dreams and trust that God has everything under control. Thank you for sharing at The Weekend Brew!